Posted By:Unknown | At:5:00 PM Be the first to comment! This story almost makes me want to start watching hockey....N'all I'm lying...lol! (Huffingtonpost) -- President Barack Obama wasn't in attendance at the Verizon Center to see the Capitals take on the defending Stanley Cup champions Boston Bruins for Game 3 on Monday night. But his face did manage to make an appearance.. several times. 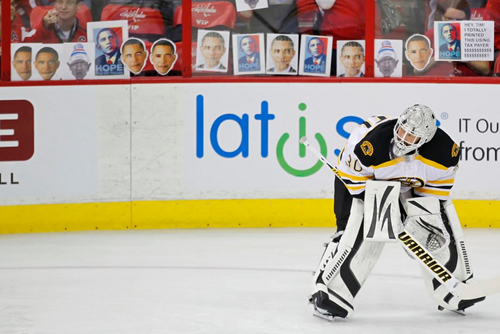 Capitals fans used pictures of Obama's face to taunt Boston's star goalie Tim Thomas, who skipped out on the team's visit to the White House back in January months after the Bruins won the Stanley Cup. Despite being named Stanley Cup MVP, Thomas refused to join his team in D.C. when Obama honored the Bruins, citing political issues. In a statement posted on Facebook, Thomas said he believes the federal government "has grown out of control" but also wrote that he blames both political parties. Before the playoffs began, Thomas abruptly ended a media session when a question was asked about the skipping out on Obama. Capitals fans didn't let him off the hook that easily. In honor of Thomas' White House snub, several Caps bloggers coordinated a fan effort to revisit the story and taunt him with pictures of Obama's face and posters depicting the president (some which were gigantic). Unfortunately for the Caps and their fans, Thomas and the Bruins got the last laugh with a 4-3 win to take a 2-1 series lead.